United Way of Greater Milwaukee & Waukesha County’s campaign focuses on creating lasting change through fundraising and volunteer goals. For the first time, United Way of Greater Milwaukee & Waukesha County kicked off their annual Community Campaign right at home at their Milwaukee offices. 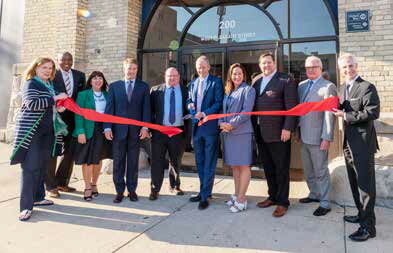 The event coincided with the grand opening of the Johnson Controls Volunteer Center, located on the ground floor of United Way’s Schlitz Park location. United Way’s 2018 campaign and volunteer leadership cut the ribbon on the brand-new Johnson Controls Volunteer center alongside sponsors Mark Irgens of Irgens and George Oliver of Johnson Controls. In June, United Way announced a Community Campaign goal of $56 million, which will impact hundreds of thousands of local individuals and families by supporting 220-plus programs at more than 110 local agency program partners in the areas of health, education, and financial stability. Also announced at the Kickoff event was a goal of 40,000 volunteer hours, to be completed during the newly-expanded Seasons of Caring. The Volunteer Center is generously supported by a $1 million gift from Johnson Controls, pro-bono design and construction administration by Irgens, and additional sponsorship support from Rockwell Automation, Interstate Parking and HSA Bank, a division of Webster Bank, N.A. The new space will elevate existing volunteer efforts to focus on additional ways for corporations, families, and individuals to give back to their community. Attendees at the campaign kickoff event were invited to tour the center. 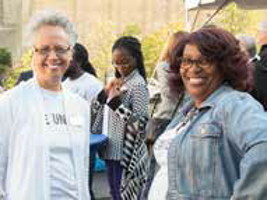 United Way’s Rhonda McLin (L) and Dracy Lockett (right) celebrate the kickoff of the 2018 Community Campaign. Attendees of the event also heard from the 2018 United Way campaign co-chairs. United Way’s 2018 Community Campaign results will be announced on December 12 at the Campaign Closing event hosted by Aurora Health Care at the Italian Community Center in Milwaukee. There are many ways to get involved in with the campaign. You can donate through your workplace giving campaign or make direct personal contributions. You can also volunteer as part of a group or as an individual. United Way invites you to join the movement, because change does not happen alone. To live better, we must Live United.